Rose gold is simply amazing! 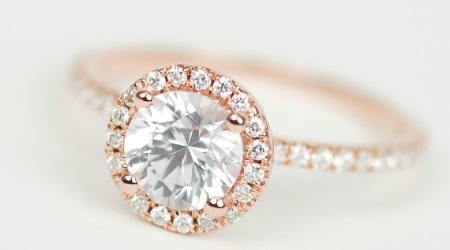 You may be wondering what exactly is rose gold. Rose gold is a mixture of gold and copper alloy typically consisting of 75% gold and 25% copper, totalling 18 karat rose gold. The more copper, the more prominent the color of rose. A mixture of these metals is sure to make your ladies ring stand out around all others! Take a moment to look at these 10 gorgeous rose gold engagement rings. This two tone ring is gorgeous, wouldn’t you say? Made up of both rose and white gold and surrounded by too many diamonds to count without losing track this ring is sure to turn heads! The center round diamond is the most classic cut and boasts the most facets at 58, giving is the classic diamond shine that we all love! Big things come in small packages. This band is so simple, yet stunning. 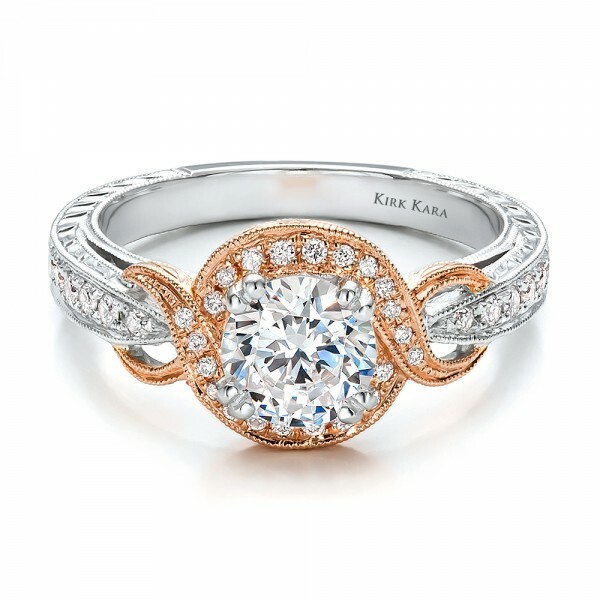 Don’t you love how the diamonds are endlessly twisting around the ring in a spiral, seemingly hugging the rose gold? Thin bands are perfect for smaller fingers, or more modest brides to be! This round blue sapphire is prong set and circled by 14 diamonds set within a two banded ring, which is also set with diamonds down each side! What a statement this will make! 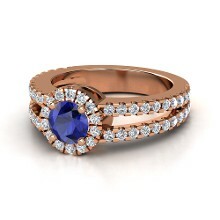 If blue is her favorite color then this ring would work well. Give her your heart! Each time she looks at it she will always remember that she has it! 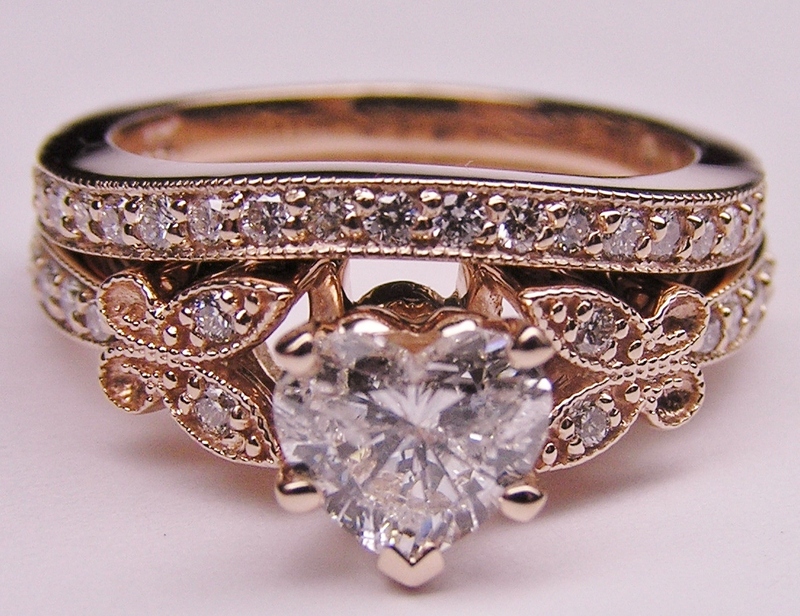 This stunning heart shaped ring is well balanced with intricate designs and diamonds throughout the ring. 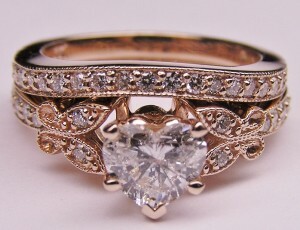 The beautiful rose gold surrounding the diamonds to give it a feminine touch that a traditional gold could not afford. Oh my! This ring speaks volumes and volumes with it’s eighteen diamonds surrounding the main cushion diamond center stage, as well as the diamonds lining the band on all three sides, showing off if you will. 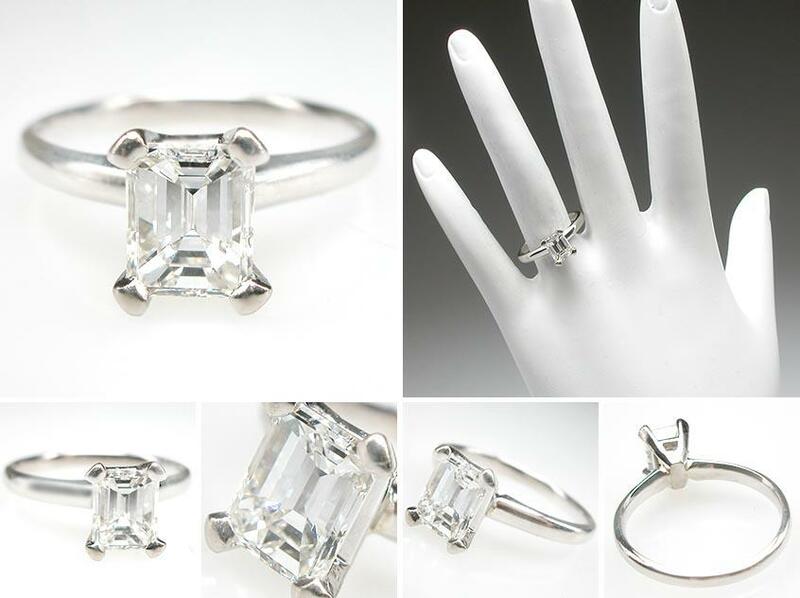 This ring is sure to make her heartbeat quicken, with love for you of course. 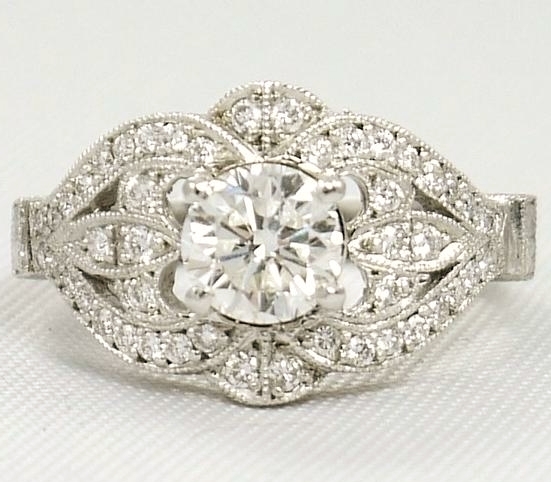 This ring would bring any bride to be to tears, of joy that is! 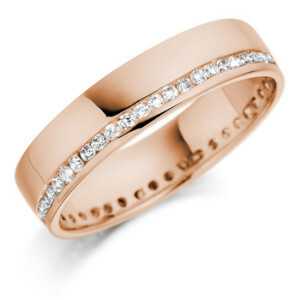 This wide band made of rose gold with diamonds lining one edge is simply amazing. It is very simple but you can almost feel the comfort and pride as it slips comfortably onto the finger. Any bride would be proud to show this off to her friends! 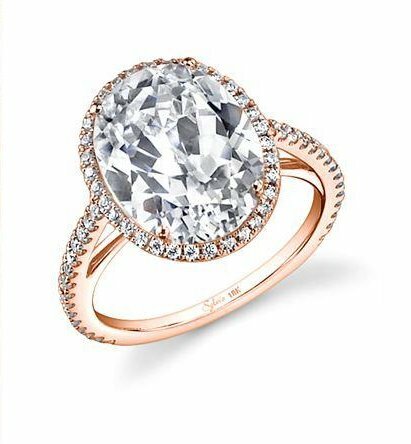 Imagine opening the box as you ask for her hand in marriage and her laying her eyes upon this beautiful ring for the first time. It is stunning, wouldn’t you say? A very feminine ring for your lady. 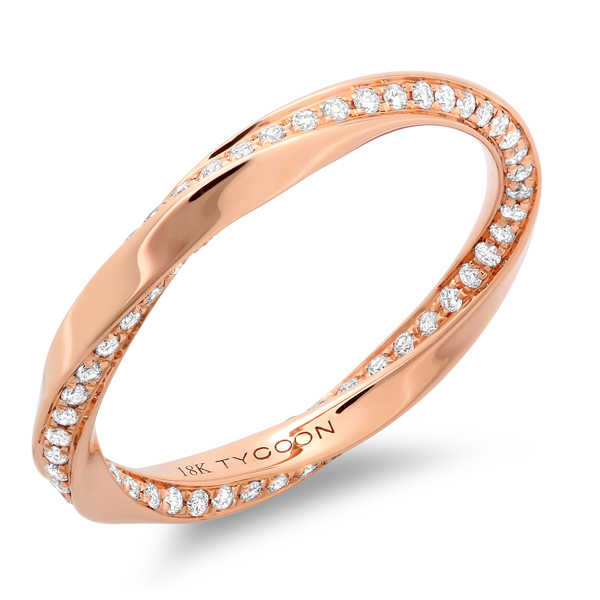 The round cut diamond surrounded by diamonds set in rose gold with 4 points of rose gold that resemble pink pearls and diamonds lining the thin band of the ring make it simply stunning. Not your typical emerald at all, this diamond is cut in the emerald fashion with it’s stair step design. 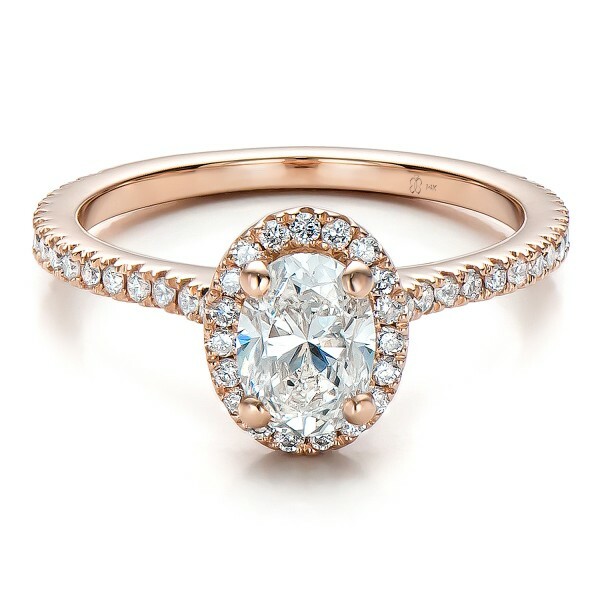 It is held in place with delicately placed rose gold with two diamonds on each side of the ring. 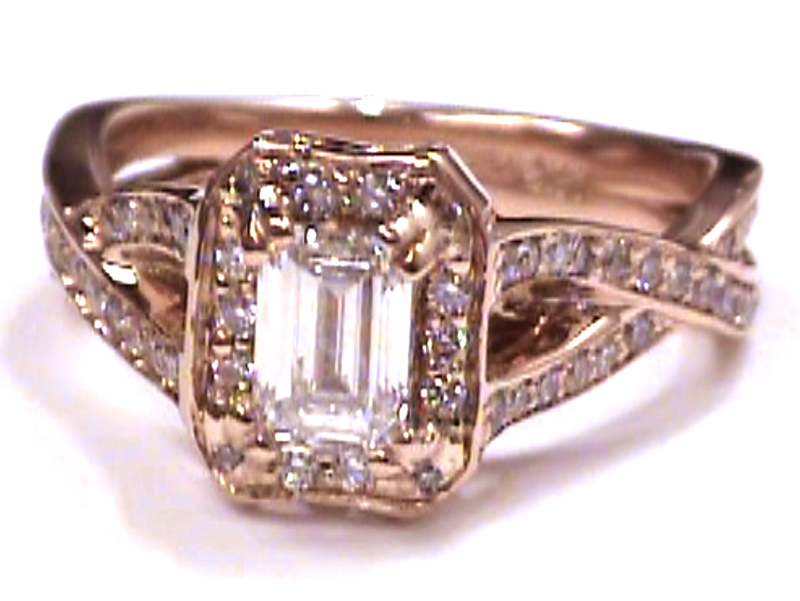 The diamonds are set on the top sides of the ring about a quarter of the way down. Gorgeous! 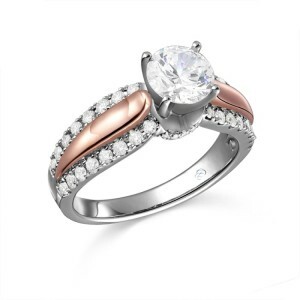 What could be more beautiful than a round diamond set in white gold accented with rose gold! 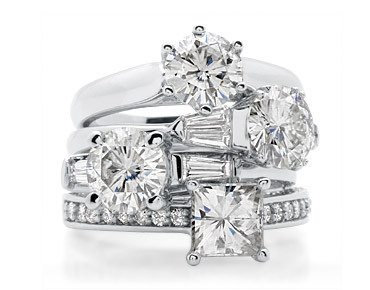 This sophisticated ring would most definitely show your bride to be how much she means to you. It’s elegance is outstanding with a wider band, diamonds split down the sides, and each side featuring 8 diamonds, with wisps of rose gold between the sets of diamonds. 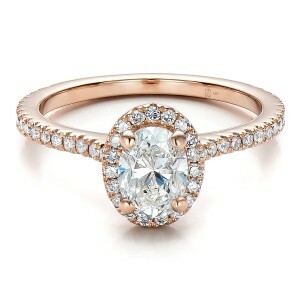 The main round diamond sits high above, commanding attention, with sparkles from the band highlighting its beauty. The oval halo ring commands attention! Imagine seeing this upon your ladies tender finger? 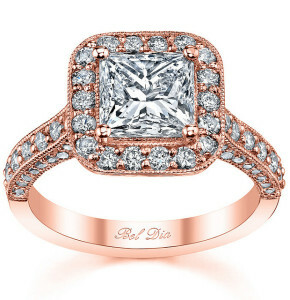 This ring would melt any womans heart. 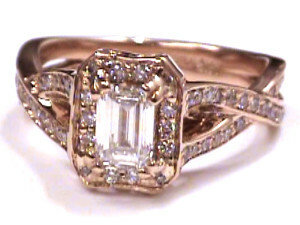 The large oval cut diamond is surrounded by 19 diamonds and the band is inlayed with them as well. Do you see the butterflies on each side of the heart? Each is inlayed with two diamonds as well! The diamond is prong set and is 14 karats in weight.